Architecture is usually about making things that are firmly rooted in place. But AIA Vermont received one of eight component 2013 AIA National Innovation Fund grant awards with its proposal “Archistream: A Mobile Design Gallery and Education Center.” While the name for the vehicle is still under discussion, the project is well underway. The organization purchased an Airstream trailer in October, and now it’s preparing to redesign it. When complete, it will travel throughout the state, delivering programs that advocate for local architecture, design, and planning. 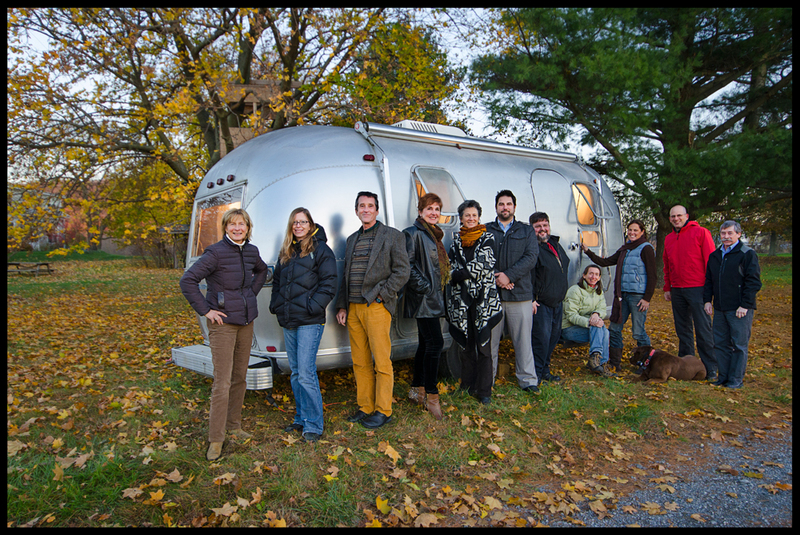 Members of AIA Vermont with the Airstream trailer. Photo of Carolyn L. Bates Photography. Gayer wrote a proposal outlining the purchase, redesign, and operation of the trailer. Miklos supported the idea passionately, but could hardly believe it when AIA Vermont found out it had been selected for the $42,750 grant. “Finding out that we received the grant was a big surprise,” she says. “People still think of Vermont as one of the smallest, most rural states, and we got the largest grant. So it's quite a feather in our caps!" 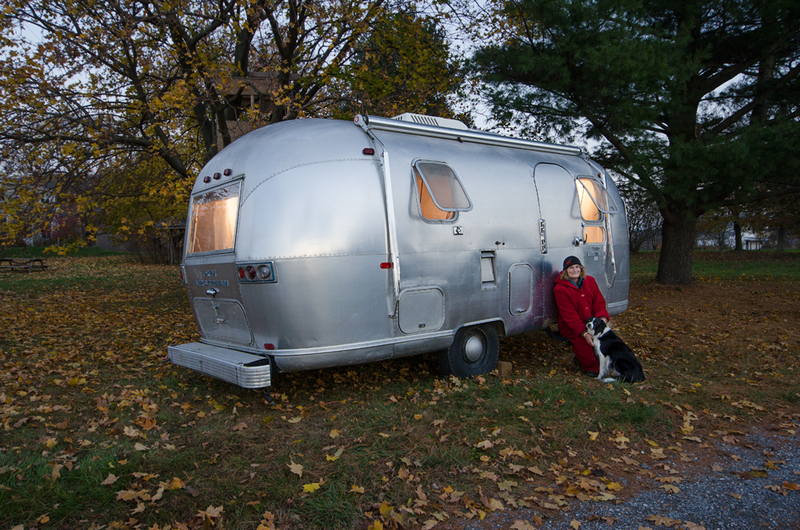 The trailer's signature curving aluminum outer shell serves as a key design inspiration. “The image of the Airstream, so iconic, rallied our energies for the project,” says Gayer. “Nick” by Carolyn L. Bates Photography. Read the complete article on the AIA website. AIAVT is just one of eight Chapters of the national group awarded a grant from a 65-applicant pool. The grants were awarded as part of the AIA Repositioning Initiative to generate greater awareness of AIA, architecture, and the value architects bring to community planning, historic preservation, land conservancy, disaster mitigation and remediation, and other processes. The project also offers the opportunity to shape a thoughtfully calibrated and crafted micro-interior for the vehicle. Stonorov noted that the school's model shop is equipped with advanced fabrication equipment such as 3D printers and a 4x8 CNC router, and that these technologies are enhanced by Vermont’s traditions of construction. “I see the trailer's new design as a joining of the high tech and the handcrafted,” she said to AIArchitect. She imagines that the students might work with felt, resin, and hardwoods to fashion a warm interior to contrast with the vehicle’s streamlined exterior. While the Archistream will showcase AIAVT-winning design projects and other AIAVT activities, the AIA team hopes to develop programs in collaboration with local organizations such as Preservation Trust of Vermont and the Vermont Arts Council, and to see it used to host seminars, showcase innovative design materials and technologies, and screen architecture-related videos. “The trailer will also be available to visit schools, town halls, and county fairs; really the options are infinite. Who knows—we might ignite a spark in one of the students that leads to the next Frank Lloyd Wright,” Korzun said. According to sources at AIA National, the “repositioning ambassadors” responsible for selecting the grant recipients said the Archistream concept squarely met their definition of innovative, and that its outreach value was not couched in the social media or digital campaigns people have come to expect these days, but rather in good, old fashioned face time—something they tagged as positively disruptive.